Buffalo check plaid has been around for years but it seems to be surging in popularity this year. 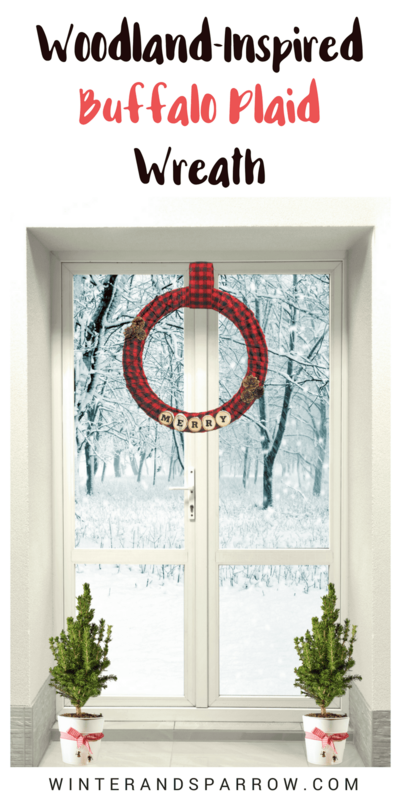 All you have to do is browse the Christmas displays in your local home decor store and nine times out of ten, you’ll come across something adorned in buffalo plaid. I’ll admit that I too am taken in by this traditional print. Whether it’s a flannel shirt, Christmas ornament, table runner or pillow, I can’t get enough of that red and black pattern. Once I removed the fall decorations from my front door, I realized it was screaming out for a touch of buffalo plaid something. Since holiday wreaths can be pricey this time of year, I decided to make my own. 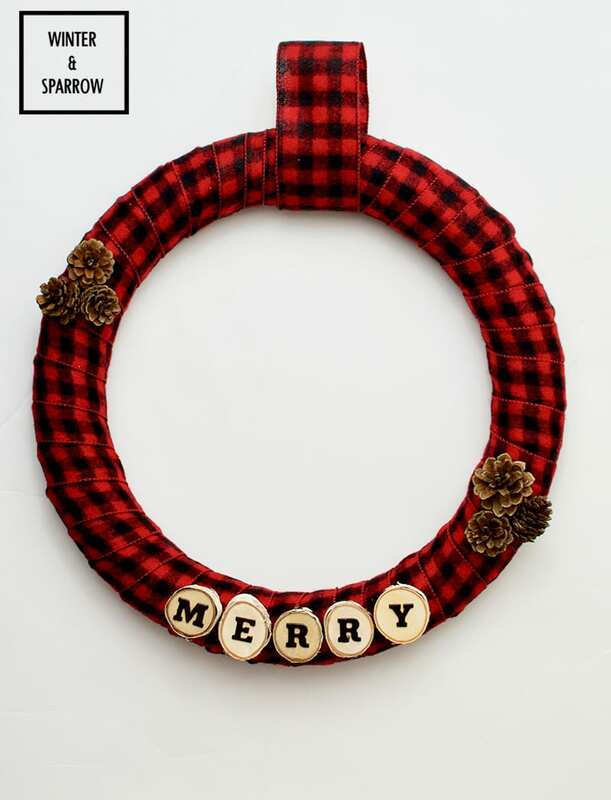 For a whopping $11, I made a woodland-inspired buffalo plaid wreath. It was super simple to make and today, I’m sharing with you how I made it. 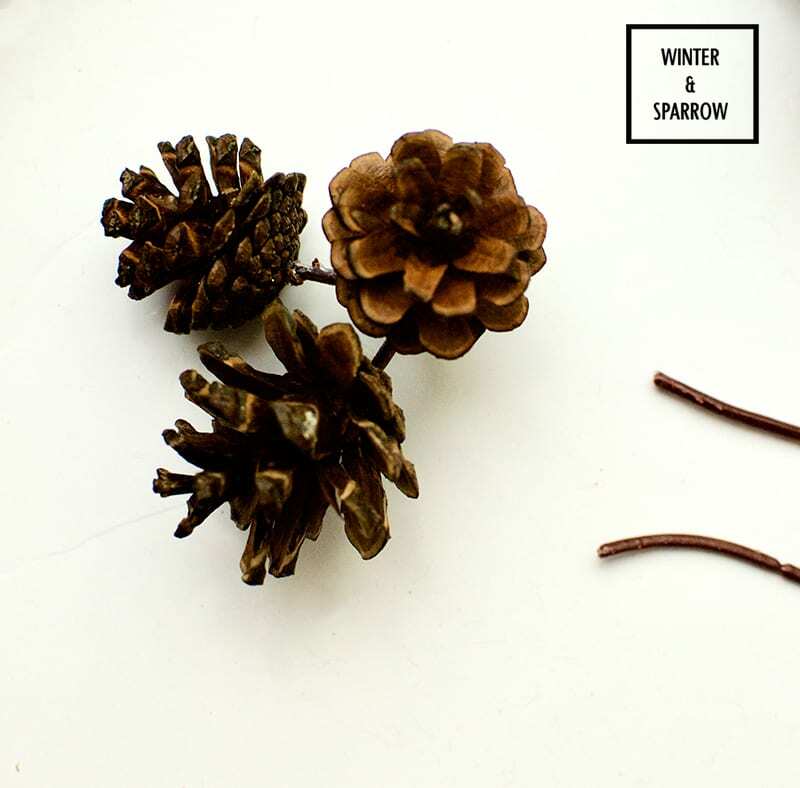 Affiliate links have been used which means Winter and Sparrow makes a small commission when you make a purchase. This helps offset the cost of running this blog. Thank you for supporting us (especially since no additional cost is passed on to you). 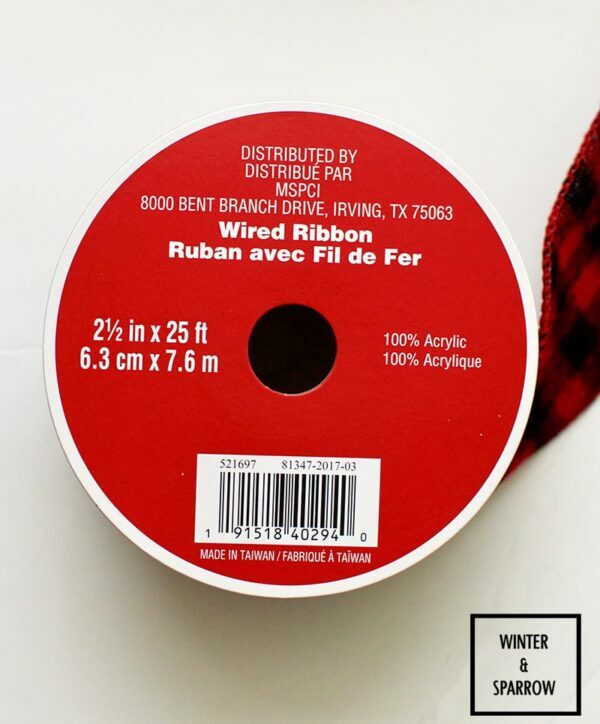 buffalo Plaid Ribbon (2.5 inches in width; wired) Michaels, Amazon, Hobby Lobby. Birch Rounds (I bought the value pack bag at Michaels). Wrap the ribbon around the wreath form. The overlap width is up to you. Secure the end with a drop of super glue. If you’re using pine cone pics, remove the pine cones from the pick. Just yank them off 😉 Now you’re probably wondering why I didn’t just use small pine cones for this project if I was going to remove the picks. The reason is these pine cone picks were 74 cents each at Michaels whereas the bag of pine cones cost $5.00 and they weren’t in the greatest condition. 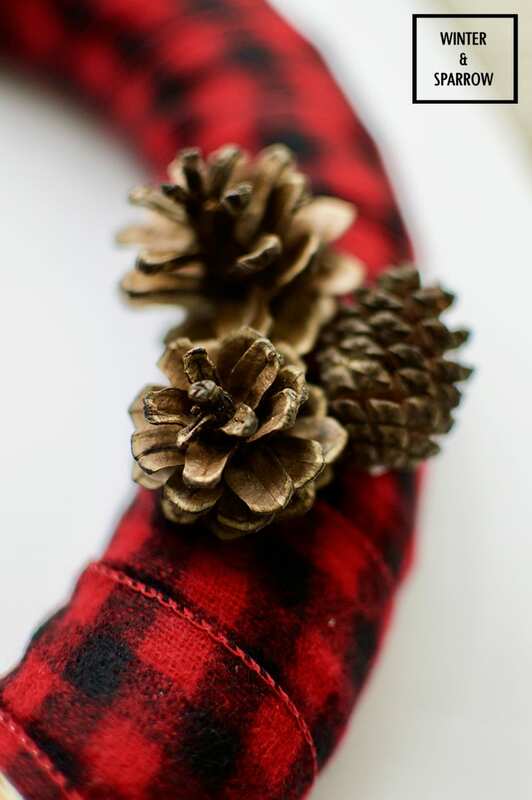 Determine where you want to place the pine cones on your wreath and then secure them with a drop of superglue. Note: I prefer using super glue vs. hot glue whenever I’m working on a project that will be outdoors. It’s more durable. Next, decide what sentiment you’d like to put on your wreath. I decided to use the word merry so I superglued five birch slices to the bottom of my wreath (one for each letter). Next, I peeled off my adhesive letters and placed them on the birch slices. Note: You can find sticky letters in just about any craft store. Make sure they’re small enough to fit on your birch slices (my letters were 1″ in height). 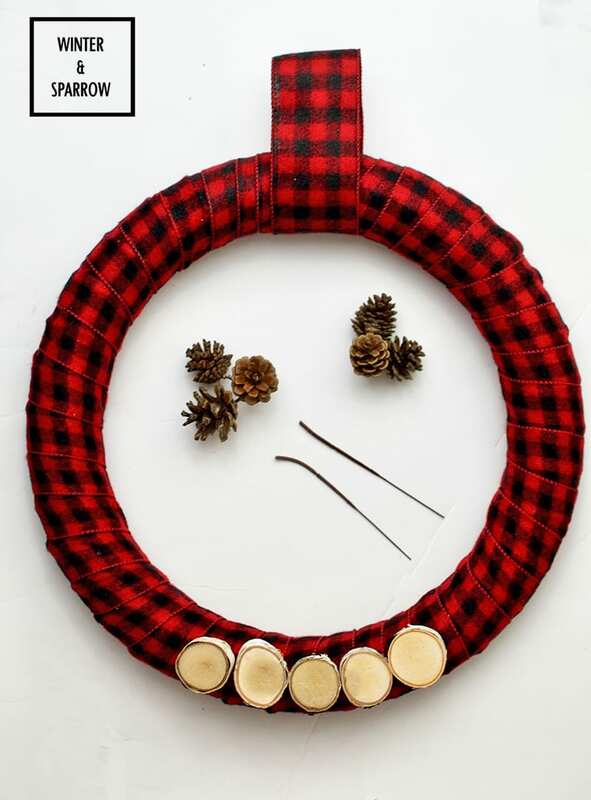 Cut enough buffalo plaid ribbon to make a hanger for the top of your wreath and secure with a drop of…you got it, superglue. I highly recommend letting the superglue dry overnight before you hang up your wreath. It will be worth the wait! If you enjoyed this project, we’d love if you pinned, tweeted, or shared on Facebook. Thanks so much! 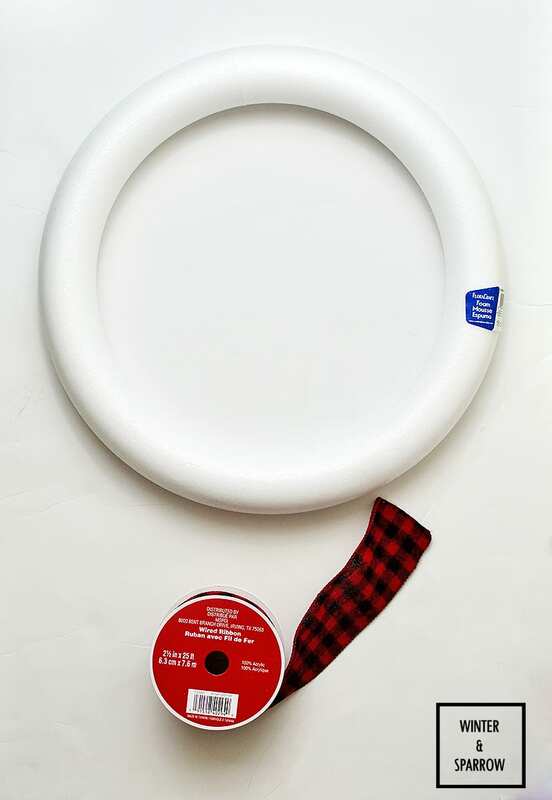 Are you a buffalo plaid fan? I love this!! So cute and yet so easy to make. Love making crafts for the Holidays. This is so pretty! I need a new wreath for my living room and I might just have to attempt a DIY and make my own. I love buffalo plaid! This wreath is too cute. It looks very simple to DIY. 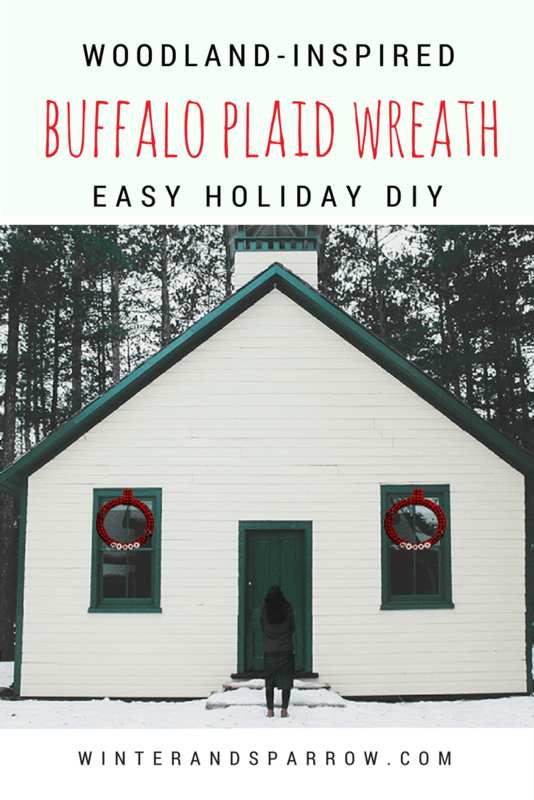 What an adorable wreath, and your post made it seem so easy to make! I love plaid. I already have a Christmas wreath, but I am thinking of modifying this for an after Christmas Winter wreath. How cute is that! I live in the middle of the woods. I made my first wreath for the 4th of July and really enjoyed it. I may have to make this wreath this weekend. It would be a fun project to do with my sister.